RULES UPDATED – 4th November 2018 | Last edited by CustomStats, EpicFlamingos and Arbiter. 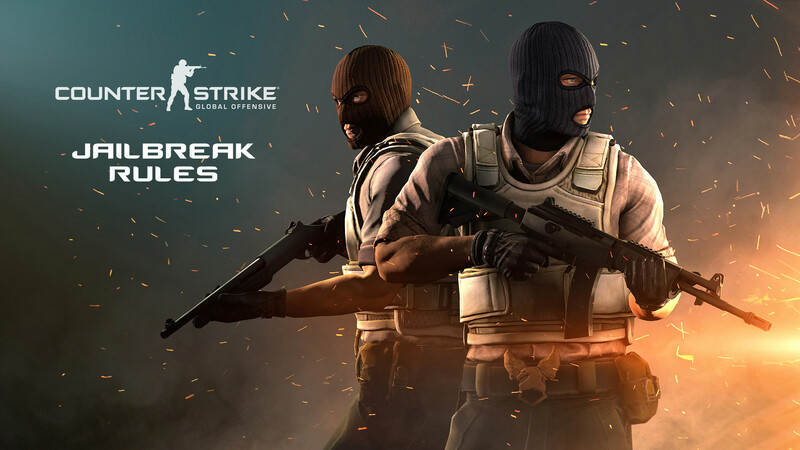 Jail Break is a role-playing game mode which simulates a jail environment – players are divided into three groups. The groups are Warden, Guard and Prisoner. A warden is selected at the start of the round once a guard types !w – only the warden determined by the plugin can give warden-type orders. The objective for the warden is to maintain control to prevent a rebellion and eliminate prisoners by giving clear & specific orders and playing games which results in killing losers and those who fail to follow orders. A guard must maintain control in the jail through killing Prisoners who do not follow the orders or who are rebelling. They must protect the Warden as many Prisoners will try to rebel to kill the warden to cause havoc and win the round. A guard must become warden when there isn’t one. A prisoner (also referred to as T’s, Terrorists) seeks to win the round either through following orders to achieve Last Request (!lr), or by rebelling. If you rebel, you will turn red and can only be pardoned by the warden. Do not talk over the warden. Do not kill or injure your own team-mates unless ordered by the warden. Do not join Guard if you are not going to be warden, unless there are more than 4 active wardens. Do not complain or argue – report any rule violations in admin chat only once. Do not influence RTV votes. When the warden dies, it is a freeday until new orders are given (this does not count towards the Special Days Limit). All T’s are pardoned unless they damaged a guard or are actively rebelling (red, inside armory/vents, etc.). ST’s are automatically revoked. As a T, you may look for loopholes in orders when appropriate. If you are basing your actions of these technicalities, end up being killed for them, and then begin to complain, you are in the wrong. Type !guard to join the queue for Guard team, and type !leave to leave the queue. Type !w as a guard to join the warden queue or to open the warden menu. Type !sd as a warden to use special day menu. Type @ followed by your message to make a report in admin chat. Type !lr if you are one of the remaining 2 T’s alive to initiate Last Request (Cannot LR on warday). Type !peace as a warden to temporarily mute Guards and Prisoners. AFK Freeze – You cannot do anything at all except use text and voice chat unless it will kill you (e.g. getting out of pool to stop yourself from drowning then AFK freeze). Freeze – You cannot use movement keys but you can look around, jump and crouch. Contraband – All types of grenades, primaries, secondary’s and jihad-C4. Freekill/RDM – It is when a prisoner is killed even though they did not rebel. Special Treatment (ST) – A warden can grant Prisoners ST in exchange for contraband, blood-hounding (cannot blood-hound without reward), or by earning it in a game. ST can be any form of special treatment the warden permits (i.e choosing next game, freeday). Shift/Crouch Walk – You cannot Jump when told to Shift/Crouch walk unless stated otherwise by the warden. Directions: “North, East, South, West” – North is the arrow blip on your mini-map radar and other directions can be determined using this information. Distance: “One Step” – Being told to “take one step” can either mean a single jump in a direction or being knifing distance from the location. A warden should give more precise orders if they want you to be within a specific distance (e.g. be knifing distance of X). T-Secret – Getting something which is hidden or a place where a T can hide themselves from the CT’s. A prisoner is automatically KOS for doing this but the warden can pardon T-Secrets for ST’s or during a freeday. Last CT/Guard – Last Guard with the beacon MUST kill all prisoners except the remaining 2 T’s unless they are rebelling (it is automatically activated by the server when there is only 1 Guard alive whilst there are more than 4 Guard’s in the team). All orders are singular – Being told to “jump” means jump once, being told to “crouch” means crouch once then stand up (unless you are being told to remain crouched or to keep jumping …etc). You can AFK Freeze to type. New orders override previous orders – Being told to “keep jumping” and then a new order of “stay crouched” does not mean you should be jumping and holding crouch unless you are told specifically in the same order to “keep jumping and hold crouch”. Common Sense: You cannot go anywhere except where you are told (example: If you are told to “go to climb” and then you are told to “jump” – it does not mean you can leave climb to jump). Numpty Clause: if you are told to face cells and then told to do “180 degree turn” then you are told to “jump”, it does not mean you face cells. do not follow orders given by the warden and guards within 3 seconds. do not drop a contraband when told by a Guard after 3 or more seconds. do not back away from a Guard when told to do so. go into or attempt to enter restricted areas: Armory, T-Secrets, Ventilation Areas and Weapon Caches. kill or injure a Guard without their consent (even if they are baiting). have a contraband out for 3 or more seconds unless told to do so by the warden. interfere with games in any form or activate buttons/controls meant for Guard’s. throw any type of grenade or shoot a weapon unless ordered by the warden. leave cells before being told to by the warden unless it has been 2 minutes since round-start. cheat, detour or delay in any of the orders or games. Freekill and freedamage – this means injuring or killing non-rebellers. Shoot into stacks – instead take cover and get the warden to unstack them. Give false orders or impersonate the warden. Open cell doors or press game buttons until you are told to do so by the warden. Be a Guard if there are not enough Guard’s with a microphone and being warden. Randomly spam-fire your weapon or randomly throw any type of grenade. Aid the prisoners to rebel (gun-planting, baiting, randomly opening vents, not upholding orders, delaying games). Play prisoner games unless it is LR, a freeday, or required to pursue a rebeller. Damage vents or go into them unless you hear/see/suspect a prisoner has gone through (do not camp vents). Kill prisoners for twitching (small mouse movements) when told to be AFK frozen. Kill prisoners for being close to you unless you tell them to back away or to keep a certain distance. Be out of sight from prisoners, unless actively hunting rebellers (do not camp restricted areas). Pick up any T weapon caches/secrets, even if it was dropped by a T (except if it’s interfering with gameplay or on a freeday). Partake in T-Secrets without actively pursuing the T’s unless it is LR/freeday (do not camp secrets). Open cells without giving orders. Keep prisoners in cells after 2 minutes from round-start. Give orders for prisoners to carry out whilst inside cells (exception: orders to drop/throw contrabands). Give orders over text-chat. Orders must be given over mic-chat only. Give orders that refer to prisoners as anything else other than T’s, Terrorists or Prisoners. Give special treatment to some prisoners unless earned in a game, exchanged for a contraband, or for blood-hounding (all ST’s must be revoked once there are 2 non-rebels without ST). Keep prisoners crouched without allowing them to stand-up to type. Refuse to repeat unless you have repeated it once already without being disrupted. Put guards in harm’s way without their consent. Revoke a freeday, warday or hide and seek given by another warden before 4:00 (round timer counts down). Restrict prisoners from using text or voice chat (exception: !peace command). Lying to the Prisoners, for example: you can’t pardon a rebeller only to kill them once they come out even though they didn’t rebel since the pardon. Confusing the Prisoners, for example: “When I say go which is not now, go to the blue circle”, then opening the cells and killing everyone who went – or giving so many orders quickly to make them loose track…etc. Misleading the Prisoners, for example: “When I type go, all Prisoners go to the big cage”, then saying “go” over mic and killing Prisoners who went. Trapping the Prisoners by using terms that are closely familiar to the one they are waiting for you to say/type, for example: typo’s, saying “glow” when awaiting to say “go”. Games must be explained by the warden before starting. Games must give all prisoners a chance to fairly participate and compete. Example: It is unfair to force prisoners closest to winning to keep on going when there are prisoners behind them. Games that are custom (not a map-game) must not be too difficult unless the warden can successfully demonstrate it in no more than 1 attempt. Games must not be played inside cells. Games must not delay the round, and they must be productive (there must be winners/losers). Games must not reward prisoners with a prize to pick more than 2 prisoners to die. The first game played at the start of each round must be a map game that can be stopped or recalled. This game cannot be the same game played at the start of the previous round. Games cannot be played twice in the same round. Exception: This rule does not apply if a prisoner stops the game before any prisoners die. Games must not kill more than 50% (ignore decimals) of the participants in a single game. Exception: This rule does not apply for special days. Exception: This rule does not apply for luck-based games or opinionated games. Exception: This rule does not apply for prisoners who could not complete the game UNLESS the warden is able to either 1. class the “furthest/closest” X prisoners as winners or 2. use the “hot lava” concept to eliminate prisoners without killing more than 50%. Any type of special day can only be given once per 3 rounds. The warden must activate and choose as special day using the !warden menu or by typing !sd in chat. The warden MUST explain the special day. Warday zones must provide Prisoners a safe chance to get guns and leave armory and zones must not be accessible only via a closed-entrance (example: closed door or teleporter). Warday automatically expands at 6:00 or after if specified by the warden but cannot be any later than 4:00. Guards must not leave the warday zone until it has been expanded (unless Last CT), and they must not kill outside the warday zone unless they are on-route & were attacked first (self-defense). Prisoners must actively pursue the Guards and you cannot !lr on a warday. A freeday can be customized but it must not restrict areas that aren’t already automatically restricted (armory, vents…etc) and it must not restrict more than 1 movement command (example: you can restrict Prisoners from walking forward, but they can still move left, right and backwards – or you can restrict them from standing up unless they are standing to type…etc). The freeday is automatically revoked at 4:25. Warden must give Prisoners at least 45 seconds to hide but cannot exceed two minutes from cell opening. Guards must stay in armory and cannot peak out of armory or into vents until it is expansion time. Prisoners may hide in restricted areas except armory and Guards can go into restricted areas without suspicion. Guards must kill all prisoners with the exception of the last two prisoners that reach last request. Prisoners have 45 seconds to find weapons and a safe place before they must kill other prisoners until only two are remaining for last request. If there are more than 2 prisoners alive after 5 minutes then all prisoners will be automatically slain. Prisoners must not delay the round by camping and they can team up with other prisoners but they can betray each other at any point. During this special day, Guards cannot be hurt, and must not hurt prisoners or assist prisoners in any way (e.g. blocking bullets, dropping guns, telling them where other prisoners are, using anything to kill or injure them …etc). Warden MUST open cell doors within 5 seconds of activating Hunger Games. Custom Hunger Games is not allowed (i.e. ordering prisoners into a closed off location before activating HG). Last Request (LR) is achieved once there are only 2 non-rebel prisoners remaining. You can type !lr in chat to select a last request, or you can do a Custom LR if the guards choose to participate. You must not use !lr on wardays. You must not use “Hot Potato” in a spot that will kill your opponent. You can cheat during a last request, but it is rebelling. You can activate !lr as a rebeller. Guards may decline custom LR’s or unreasonable LR locations. Saying no rules implies that any form of cheating is permitted. If a prisoner begins the LR without stating any rules, basic rules (no cheating) are implied. Below are specific rules and exceptions to certain games. You are allowed to play any game that is not listed below as long as it follows the rules above. Gun toss is played by throwing the gun as far as you can from the starting point before you touch the ground- furthest being the winner – this rule is implied unless stated otherwise. These games are played by each player shooting at each other with the specified weapon. During LR, Guards must not begin shooting before asking the T if they have any specific parameters or location. You must not play this game unless there are 20 or less Prisoners alive, and it must not be the first game of the round. All orders are singular unless warden states otherwise.You must tell Prisoners that you are now playing First Reaction / Last Reaction. When the warden says “Last Reaction ” then the LAST person to do the action dies – and anyone who does not do the action at all will also die – but when the warden says “First Reaction ” then the FIRST person to do the action dies. You must not play any luck-based game unless there are 20 or less Prisoners alive, and it must not be the first game of the round. A luck-based game is any game that does not require any skill and instead requires 100% luck, for example: couch game, duck hunt, roulette, wheel of fortune, keep or pass…etc. You must not play this game unless there are 20 or less Prisoners alive, and it must not be the first game of the round. Simon says can only start with “Simon says we are now playing simon says. Simon says I’m Simon” and end with “Simon says we are no longer playing simon says. Simon says I am no longer Simon”. Warden cannot trick T’s into simon says starting or ending – prisoners must not be killed for either following the command or not. Prisoners must AFK freeze between commands (unless otherwise stated).– Simon says commands must not be used to play other games. Simon says commands must not move prisoners in any direction (forward/backward/left/right). Simon says commands must not give more than one command out at a time. You must not play this game unless there are 10 or less Prisoners alive, and it must not be the first game of the round. All questions must be factual and not opinionated or personal. You must ask all questions via text-chat only. You must not play any opinionated-based game unless there are 10 or less Prisoners alive, and it must not be the first game of the round. You must tell Prisoners what the game is before giving them the choice to play or not. Prisoners have the choice of whether to participate or not. Prisoners must not change their mind once they have chosen to play or not. There has to be at least 2 winners. Rules may be changed by CS Leadership at their discretion without any notice at all. Remember, Jail Break is dynamic and sometimes decisions need to be made. This is a guide, please use common sense when it comes to interpretation of these rules.